The Hydro version is great for beginners and professionals. The Aero version, very close to the AeroFlo in its concept, is one of the best active systems on the market. The Dutch Pot Systems are user-friendly, reliable, and inexpensive. Each pot is irrigated individually, allowing you to serve each plant as it needs.You can move each one of them any time, and rearrange your setting if required. You can transform a Hydro DP into an Aero DP in no time, and vice versa. This flexibility gives it the enormous advantage to be adaptable to seasonal conditions. During the hot days you can work with a Hydro DP and Grorox to protect the roots.And switch into fast gear with the Aero DP as soon as temperatures start to cool off. They are expandable from a few pots (1 m2 under one light) up to commercial installations of thousands. This flexibility gives it the enormous advantage to be adaptable to seasonal conditions. During the hot days you can work with a Hydro DP and Grorox to protect the roots.And switch into faster gear with the Aero DP as soon as temperatures start to cool off. 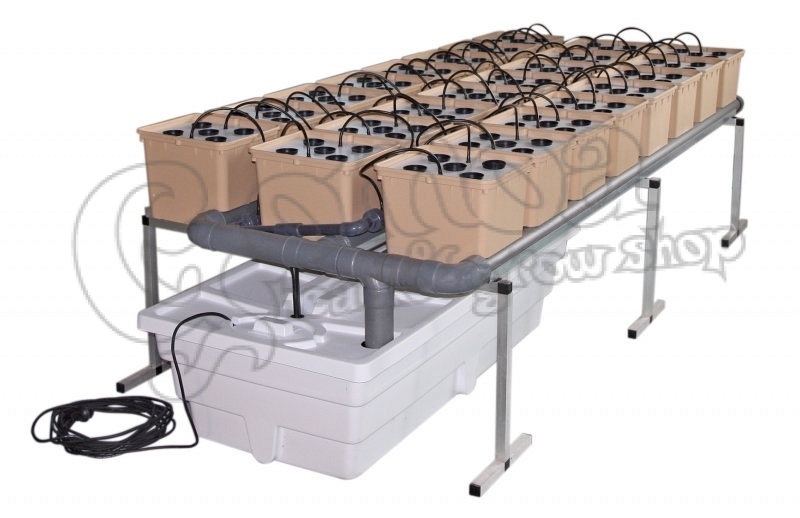 Both versions exist in 2 sizes, 1 and 2 m2, and can grow from 12 to 60 plants (1 m2) or to 120 plants (2 m2). Each Dutch Pot comes with a set of Flora-series.